Ikawe for Men 60ml. Tribulus, Saw Palmetto, Horn Goat Weed. Ikawe for men has been widely used as a natural alternative to the treatment of fatigue, lack of concentration, loss of efficiency at work and libido. It is regarded as an invigorating innovator and is preferable compared to the use of other remedies with very heavy side effects. 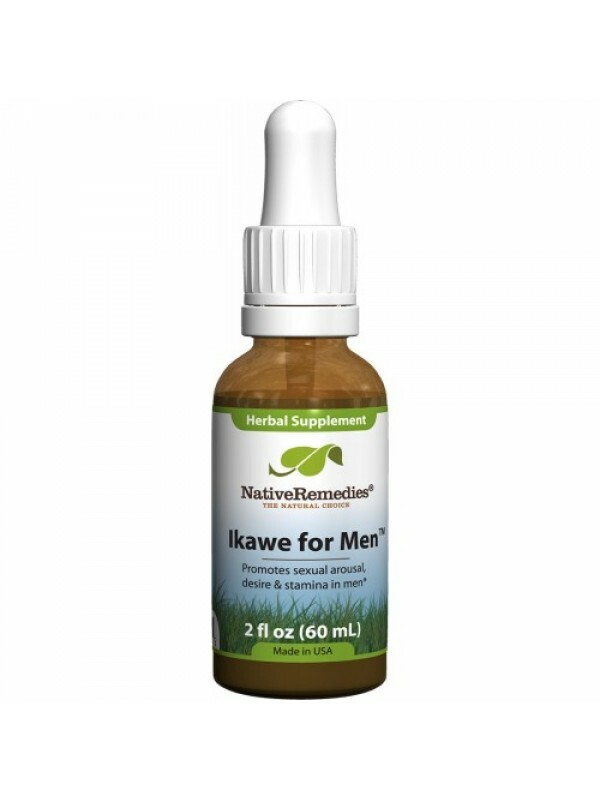 Ikawe for men serves to aid the immune system, as it can increase the production of antibodies. It can also be used to reduce bad cholesterol, improve the circulatory system and control blood pressure. It can decrease inflammation and improve well-being, in addition to balancing mood and treat insomnia caused by anxiety. To complement, it is beneficial to the heart. Dilute drops in a small amount of water or juice and drink. Siberian Ginseng: regulates the production of energy in the body, as well as maintaining the health of the nervous system, hair, skin and intestines. Horny Goat Weed: Powerful aphrodisiac. Kola nut: It improves memory and concentration because it increases the blood circulation of small cerebral vessels. Licorice: Efficient way to combat depression and melancholy. Tt has several medicinal properties, including antibacterial, antifungal, anti-inflammatory, anti-inflammatory, antispasmodic, antitumor, antitussive, antiviral, digestive, diuretic, emetic, emollient, expectorant, laxative, nutritive, rejuvenating, adrenal tonic, among many other properties. Tribulus Terrestris: Provides a longer lasting erection, increases libido, prevents prostate cancer. Sarsaparilla: Can be used for the treatment of inflammatory diseases like gout, rheumatism, arthritis and its benefits can also be noticed in skin diseases. It can also be used to eliminate excess uric acid, regulating urinary transit. Increased energy: Ikawe for men has been known for providing a greater source of energy, improving athletic conditions and still keeping the body healthy. Relief from cold symptoms: Ikawe for men have properties that relieve the symptoms of the flu, reducing fever and triggering mucus. Anti-inflammatory action: Some ingredients of Ikawe, such as Siberian Ginseng can reduce swelling, relieve pain and reduce other symptoms of inflammation. Anti-bacterial function: Ikawe for men acts in the prevention against bacteria in our body. This is because it stimulates the metabolism by raising the energy level of the body. Helps the digestive system: It is able to provide a better functioning of the digestive system, as well as boosting a greater and more efficient absorption of nutrients. Capillary strengthening: Ikawe for men makes hair healthier and stronger, as well as preventing hair loss and boosting hair growth. Reduction of blood pressure: If used moderately, Ikawe is able to lower blood pressure. But do not overdo the dosage or you may end up having undesirable effects. Treatment against diabetes: Ikawe for men can act in the reduction and regulation of sugar levels in the bloodstream. Therefore, it can be used as a support in the treatment of diabetes. Relief from Arthritis Symptoms: In addition to aiding in the prevention of rheumatism, Ikawe also helps to reduce rheumatoid arthritis symptoms, as well as reduce pain and other symptoms relieve. Weight loss: By speeding up metabolism, it allows weight loss to be more efficient. Treatment against erectile dysfunction: Some men have reported that consuming Ikawe for men regularly helps cure their erectile dysfunction. Substances suchs as Tribulus, Horn Goat Weed, Saw Palmetto helps regulate blood flow and increase energy, which is positive for the reproductive system. Treatment against insomnia: By reducing stress and anxiety, Ikawe for men automatically also reduces insomnia. Antidepressant function: The plant can be a good natural supplement in the treatment of depression, as it raises energy and helps in the formation of positive thoughts and activities. Maintenance of the lungs: Besides keeping the lungs healthy because it helps release mucus, Ikawe also helps in eliminating bacteria in the respiratory system. Renal Health: Ikawe for men acts in the elimination of toxins, which helps to prevent diseases and the proper functioning of the kidneys. Does Ikawe for men have any side effects? Some doctors do not indicate Ikawe for people who are already taking antidepressant medication because it may cause some chemical interference and impair expected results. In addition, the supplement is not recommended if you are taking treatment using specific medicines for the heart. Ikawe can influence blood pressure and cause serious problems.